The digital age is here. Not only has it become a part of our daily lives; it has also stared to cause huge changes in agriculture. With innovative technologies at hand, farmers worldwide are rethinking the management of farms – increasing their yields and income by carefully monitoring and optimizing their inputs. New ways of farm management stem from the digital transformation and “Swiss Future Farm” is a great example of how research, consulting and innovative technology come together. It provides full and practical solutions for farmers and gives the chance to experts to experience the state-of-the-art technology live and in real-life conditions. It also offers insight into the collection of data that can be continuously evaluated and incorporated into the development of new technologies and management methods. The iMETOS Decision Support Systems on the Swiss Future Farm will play the main role in collecting environmental data, used for the optimization of farm management activities and enhanced fieldwork planning, which includes plant protection and fertilizer applications, field accessibility, harvest window prediction and more. The systems installed in the fields are the iMETOS 3.3 IMT 300 weather station (rain gauge, air temperature and relative humidity, wind speed and leaf wetness sensor), the iMETOS ECO D3 system for soil moisture and rainfall monitoring, the iMETOS CropVIEW Dual field camera for remote crop monitoring and iMETOS Trackers used for farm asset tracking and management. The systems have been installed in the silage maize field with the goal of showcasing how precise measurements can help with precision and decision farming, thus optimizing farmer’s costs and at the same time also protecting the environment and the precious natural resources. 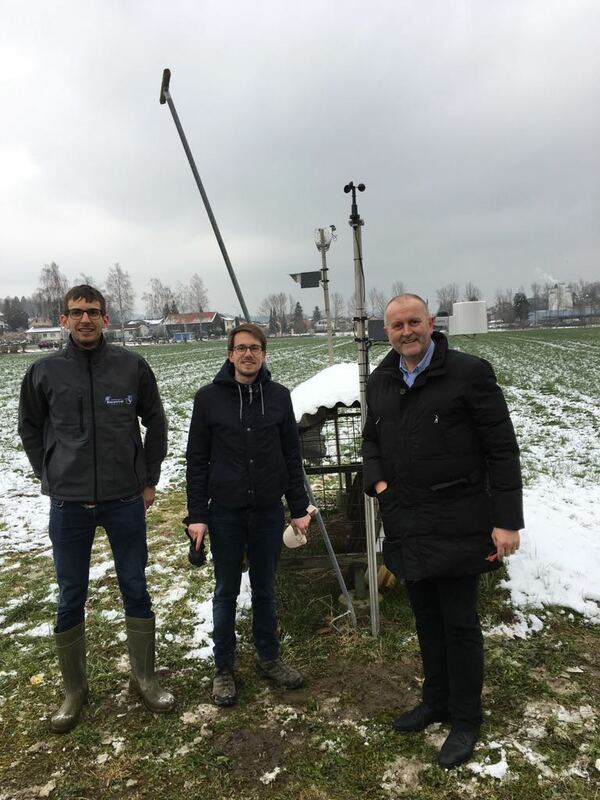 The pictures shows from left to right our Lukas Müller – Key Account Manager from Andermatt Biocontrol – Pessl Partner in Switzerland, Florian Abt from BBZ Arenenberg – one of three partners next GVS and AGCO in that project and our CEO and Founder Gottfried Pessl who installer yesterday the hardware in the field.